Our state of Washington is possibly facing a 9 billion dollar shortfall over next 2 years. State and local governments looking for ways to save money. 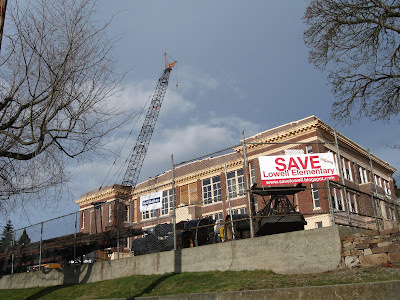 One idea is to delay the reopening of Lowell School for another year after the remodel is done. It's closed now for the renovation anyway, so people have adjusted. Just don't open it right away after remodel and save money since people have already adjusted, supposedly. Putting the school in mothballs for a while. Not literally, but figuratively. Does sound like a plan that might not hurt too much and save some money, but, lots of neighbors are objecting. What can they cut, that doesn't cause objections? Federal government has the same problems. People value the services government provides. Also, I read they've raised quite a bit of private money and volunteer labor for playground renovation.